You’ve got feet. (Well, I assume you’ve got feet since you are looking for domo slippers, there is always the possibility that you don’t have feet, but I digress….) 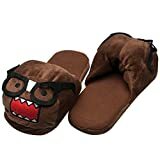 Anyway, these domokun slippers will cover your feet, keep them nice and toasty, and protect your precious toesies from bad things like stubbed toes, and playful kittens! ouch! Different sized available!